What would give you incentive to get in shape? Several months ago, the Captain found out about a race his coworker signed up to run. The distance, 6 kilometers (3.51 miles). The prize, a badge of honor. The Warrior Dash elevates the common race to near-legendary status: it combines a cross-country trek with 14 obstacles ranging from hopping a hay bale or a set of giant tires; sliding down a mudbank, running down a muddy river, and climbing back up another mudbank; climbing over a rope net or fording a neck-deep bog; to leaping a fire pit, and finally crawling through a mud slough. 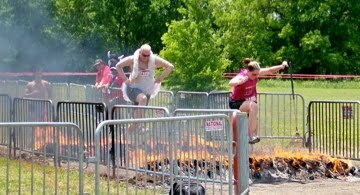 To sum up, it's a steeplechase that involves a lot of mud. Participants receive a t-shirt and a viking hat complete with horns. All who cross the finish line have a medallion draped around their neck. Who wouldn't want to sign up for this? The Captain, aspiring to challenge himself to greater fitness, put his name on the dotted line that very day. May 1 stood a comfortable four months in the future; surely he would have no trouble training in that time. At the beginning of March we started training together, using an iPhone app called Couch to 5K in 60 days. Sounded easy enough. Only after the third time, his running buddy pulled up lame. Yes, that would be me. Totally annoying, but I have popped or torn or otherwise damaged something in my hip joint. I am too young to have hip problems. But there it is. Now I'm mad at myself for being so out of shape, and have found my own motivation for getting in shape, just as soon as I get my little problem fixed. This is not my story. However, as a result of this circumstance, the Captain ended up arriving at the Dash on May 1, sans any training at all. Not to worry, he showed up with enough attitude to compensate. At this point I must digress a teensy bit. Three years ago, we hosted a pull-out-the-stops Oscar night dinner party. In my little world it's the party by which all others I ever host will be measured. 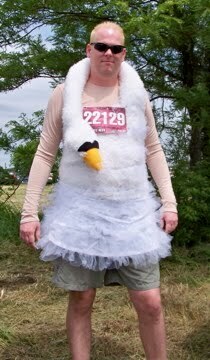 The Captain even asked me to design and make for him an Oscar-worthy costume: a swan dress like the one worn to the Oscars by actress/singer Bjork in 2001. Oh, yes he did. And yes I did. Since the night of the party, at which the Swan Dress was a complete hit (imagine the biggest guy you know, who is so comfortable with his --his words--freakishly big size, that he can get away with doing and wearing absolutely anything he wants), that labor of love has lived in a white plastic bag. When would one ever have opportunity to wear such a thing again? 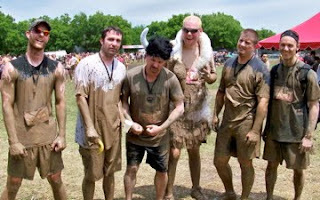 Which brings us back to the Warrior Dash. Because you know what is the perfect ending to the perfect party bird dress? A final flight across the fields, over the flames, and through the mud. 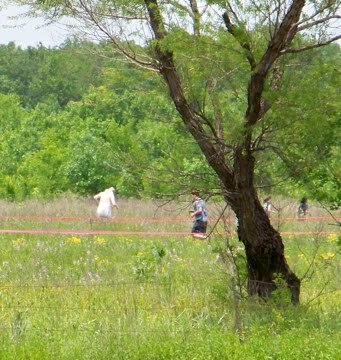 Resplendent in the Swan Dress, the Captain and I trudged almost half a mile from the parking lot to the field of honor. Within that first half mile, he had already been reborn as a near-cult icon. Car horns beeped, approving fellow racers shouted their approval, "Bjork! Awesome!" By the time we reached the main field, people were cheering, high-fiving him, and asking for photos with him. Several of the checkpoint staff smiled and said, "NOW I've seen everything!" 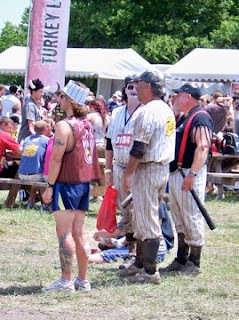 I'd estimate that a few of the Warriors took themselves very seriously, wearing their very expensive race gear; most of the rest wore shorts and tees; and about 15% embraced the over-the-top nature of the event. We ran into shield-wielding Vikings and kilt-wearing Bravehearts; a girl Na'vi from Pandora; superheroes Mr. Incredible, Flash Gordon, Wonder Woman, and Batman and Robin; business suits and a tuxedo; a whole slew of men wearing women's clothing; a Zombie baseball team; and a handful of Smurfs. Oh, and remember Waldo? We found him, as well as Wanda and cousin Odlaw. The theme teams were my favorite. Oh, how many people were there? I am so glad you asked. You do the math. Ready? When first announced, the Dallas Warrior Dash offered start times, or waves, of 1pm to 5pm, every hour. Up to 500 people would start in each wave. After the Captain and his friends signed up, the appeal of the event led organizers to add waves every half hour, then extend start times to 9am to 6pm, then... add a second day on Sunday. That's up to 500 people starting the course every 30 minutes for 9 hours, for two days. 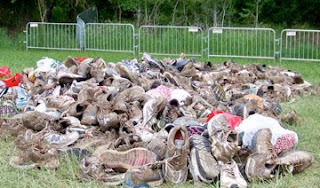 That calculates out to about 18,000 Dashers over the course of the weekend. And this is one race of 8 or 10 being run around the nation in 2010. It's astonishing, really, how the concept has captured the imaginations of so many. I think this is one of those instances where someone accidentally captured lightning in a bottle. the Captain didn't feel the need to try to run the whole way. After all, I needed him to come home, and an ambulance ride would have slowed us down. 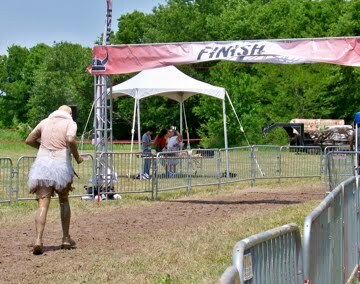 At 1pm the Swan, along with 500 of his closest competitors, picked his way through those 14 obstacles, one by one. He ran/jogged/trotted for some distances, then walked when he needed to. During the course of the race, he gained several pounds of water weight as the stuffed bird head soaked up water from the swimming obstacles. And after a relatively impressive 45 minutes, he appeared on the home stretch. The spectators could watch participants conquer the final two obstacles, a jump over the fire pit and a crawl through a mud slough. 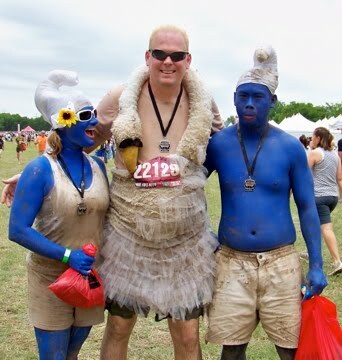 Wearing a Swan Dress, doggedly attacking this race with virtually no training, covered in mud: the Captain still crossed the finish line with dignity intact, and received a medallion to commemorate his accomplishment. What an amazing guy. So what would motivate you to get in shape? 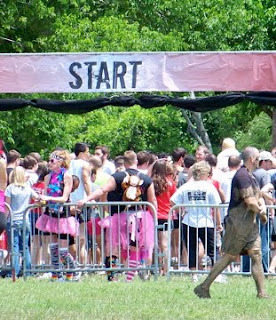 The Captain had an awesome time at this event, and has come home determined to leverage his physical effort into ongoing training for future events. We are both so out of shape, and if races like this can be the carrot to motivate us to become more fit, then you may be hearing more about crazy races in our future. But there will be no more appearances of the Swan. I am afraid the dress has sung its final song. i told dave about it too, he's going to read it tonight. too, too funny. what a man your husband is! i looked and felt about like that when i crossed the line after the 10 mile race, except all the white stuff on me was salt from my sweat. :) kudos to you on finding the carrot to pull you down the fitness path! maybe we'll have to do a race together sometime.